I've never seen so many memorable movie moments depicted so...cheerily. Take a look. I want so many of these prints that I think the Movies R Fun book may be the way to go&em;except that I can't frame a book. 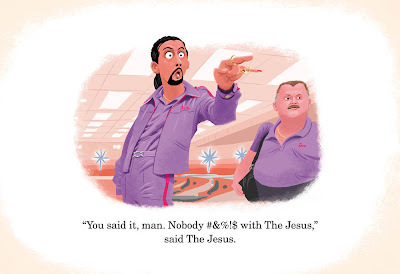 I think my favorite print is the Jesus one, just because his expression is so hilarious. But the Redrum and Sorry Dave prints are such classic scenes.... I'm torn. Maybe I need one for each room, huh?